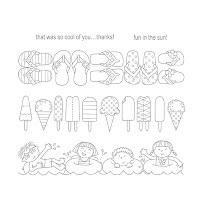 The Sunny Fun stamp set is absolutley perfect for all things Summer. 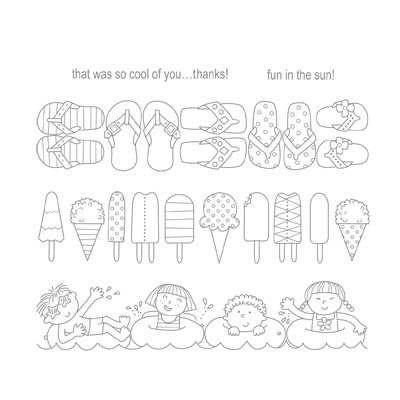 The flip-flops are adorable (the littlest ones were used on this card), the kids playing on their floaties in the water are a kick, and the frozen treats......well, who doesn't love ice cream? There is such a variety, there's something for everyone! So anyway, this was a fast, easy card to make. Choosing the colors for the flip-flops was fun, and after I was finished, I realized they coordinated with the Ice Cream Parlor DSP (retired) from Sale-A-Bration earlier this year. Now I'm thinking I need to do a card with the ice cream image next! Your torn edges remind me of the surf on the beach, so very appropriate for flip flops! Love the layers of pink! Bright & happy! Great card! I love that torn corner with the embossing behind it! Such a bright and fun card! Love how you added the interest with the embossing and the torn edges.